Invictus Yacht continues to innovate and announces the world premier of the new Hardtop version of the top of the gamma 370 GT at the next Cannes Yachting Festival. The distinctive reverse bow, typical of the GT series, is the vigorous identifying feature of a hull whose lines are sculpted as if created by nature – where the contrast between sophistication and power reaches equilibrium. Added to this is the sport hardtop, made of pressure infused carbon to minimize weight while maximizing strength. The same advantages are behind the choice of aluminum for the hardtop’s structural support. Unless otherwise requested by the owner, the hardtop is black – the choice of a neutral color was made on purpose to lessen the impact on the boat’s profile. The 370 GT is the most vibrant example of Invictus Yacht’s styling, with unique elements for a yacht of this size, like the retractable lateral terrace, the submersible gangway and an infinity of other options offered thanks to the ‘Atelier Invictus’. The row of windows along the hull open onto a majestic interior environment, conceived to fully exploit the exclusiveness of a sea cruise and emphasize the pleasurable sensation of continuity with the open air, even when belowdecks. The galley occupies the after part of the driver’s seat, a seat so large that three positions are available on the forward side while leaving space for a sink, counter and burners on the rear side. On both sides of the center console are the passageways, wide enough to offer completely safe access to the aft sunbathing platform directly from the cockpit. 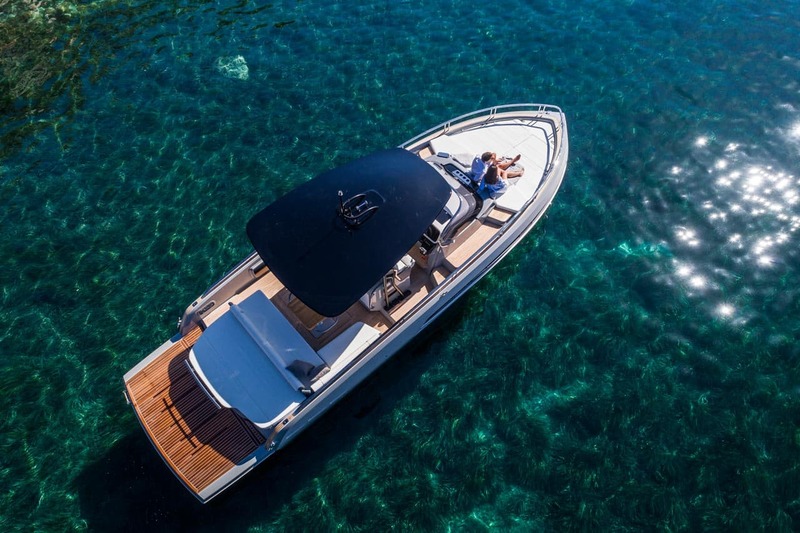 The 370 GT, at 11.4 meters in length, with a maximum beam of 3.5 meters, offers two propulsion options with the new version: either two 300 hp diesel Volvo Penta D4’s or two 370 hp MerCruiser 4.20 V8’s, for a top speed of 43 knots. The Invictus 370 GT Hardtop can carry up to 12 passengers and will be available in four color schemes: a classic ‘Personal White’, the more aggressive ‘Attack Grey’, and the delicate metallic ‘Vanilla Sea’ and the sophisticated ‘Dark Wood’.